It’s been a year since Ron and I started using Philips Sonicare DiamondClean Smart. Throughout that year we were trying to teach Alex to regularly clean his teeth but we kind of struggled. Eventually, I realised that it was because our brushes were electric, that he found difficulties. We weren’t doing the motions he needs to do with his regular brush, so he wouldn’t do them, too. Until one day he said “Mom, I want to have a brush like yours.” And then it stroke me – maybe he really needs one like ours! It’s been almost a month since Alex got his brush. I was amazed at his reaction! He was literally jumping around with happiness. Really? It’s just a brush! Then I realised – Philips have done a great job designing a toothbrush which children would actually like. 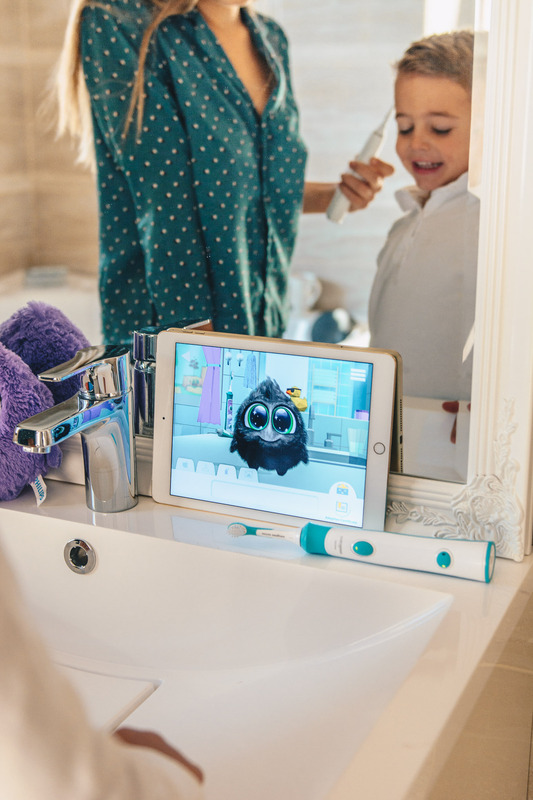 Philips Sonicare for Kids goes hand in hand with a virtual friend called Sparkly. In fact, I think that’s what captivates children so much. There’s a phone app which connects to the toothbrush via bluetooth. 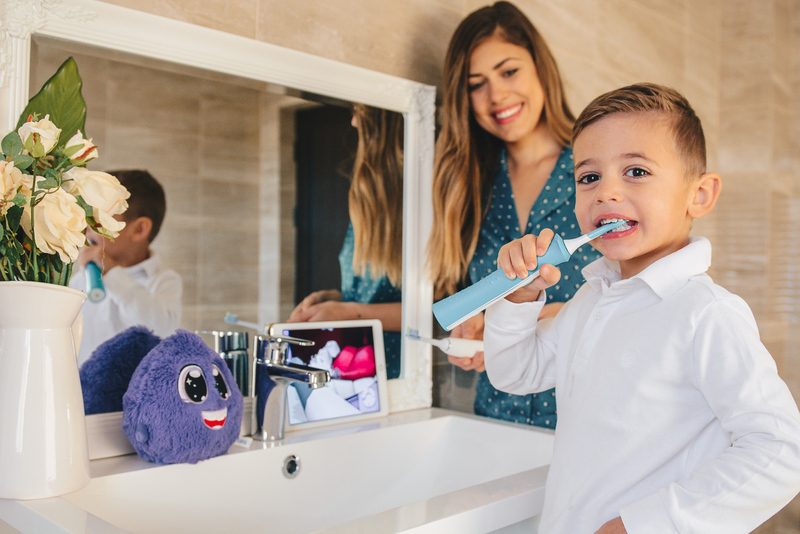 As soon as you launch the app, the child gets introduced to Sparkly, who explains how to brush the teeth. Every time Alex starts brushing his teeth, Sparkly does, too – demonstrating how to do it correctly. As soon as the time runs out, there’s a reward. Imagine the modern version of a Tamagotchi. One can give Sparkly food, although he would refuse it straight after he had brushed his teeth (again trying to teach children into good habits!). One can also change his attire, fur color, and even poke him. It’s actually quite funny for children! 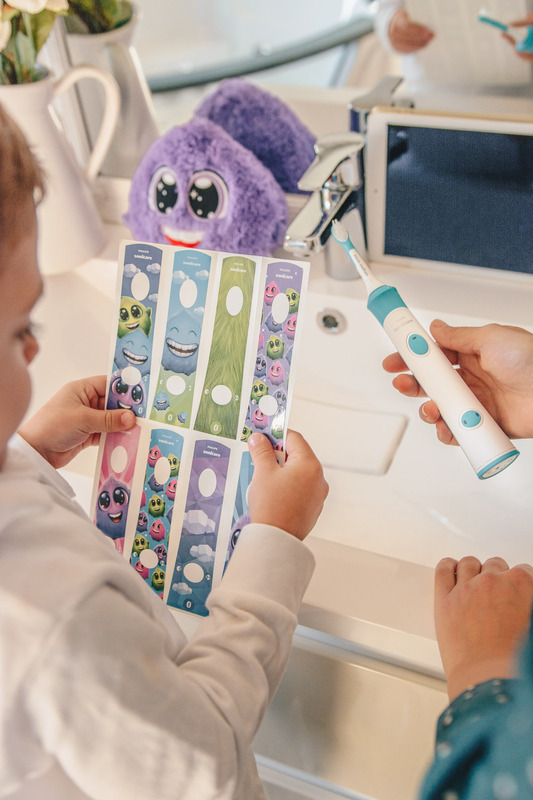 Additionally, the brush can be personalised easily with the free stickers included in the package. But it’s not everything – if you register the brush online, you can get a free Sparkly toy (one out of 100). Which is a big thing for kids, trust me! Alex started washing his teeth regularly and for the required 2 minutes per session without me insisting. He just says “Mom, I haven’t washed my teeth.”, and goes to the bathroom. He does it by himself now! I only supervise. You can change the brush heads according to the age (3+ and 7+ years). The brush has a built-in timer. Even if it’s not connected to the app, it will stop after 2 minutes of brushing. Certainly looks like a big brush for a kid, but actually is very comfortable to hold. He would get so excited sometimes that he would wash his teeth multiple times! You still need to consider that it’s a long-term investment. Brush heads need to be changed every 3 months which costs 15 euro for two heads e.g. extra 30 euro per year aside from the price of the brush. But I feel it’s worth the investment. Comes in only one color, so you can’t have a pink one for a girl, but you can always make it girly with the stickers. That Alex would fall in love with a toothbrush! That Philips Sonicare for Kids wouldn’t make such a mess if it’s switched on and out of his mouth. With my brush, it’s a rule. Never pull it out while switched on, unless you want toothpaste everywhere around you. But I love that Philips thought of that with the kids’ version and somehow adjusted it. No worries, moms – your bathroom won’t become a mess! 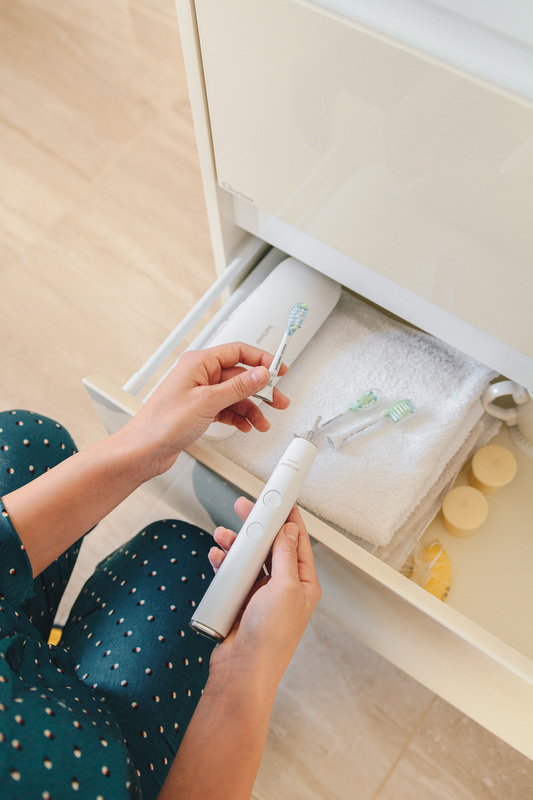 But what do I have to say after a year of using Philips Sonicare DiamondClean Smart? A year after I started using DiamondClean Smart, it’s become an important part of my daily regimen. So important, that I no longer enjoy using a regular brush. Not because I’m lazy, but because my teeth do not feel as clean and polished as they do with Philips Sonicare. The spots where I used to have plaque issues are clean. Not exaggerating at all here! I’m not consistent at connecting to the app. I used to do it frequently at the beginning, but now it’s much rarely. I have found what toothbrush heads are best for me. 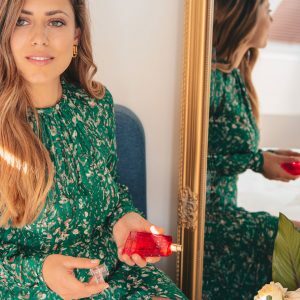 Since they need to be changed every 3 months, I tried and tested the different types and found out that White feels best for me, because it’s harder and as a coffee-drinker, I need a deep clean. 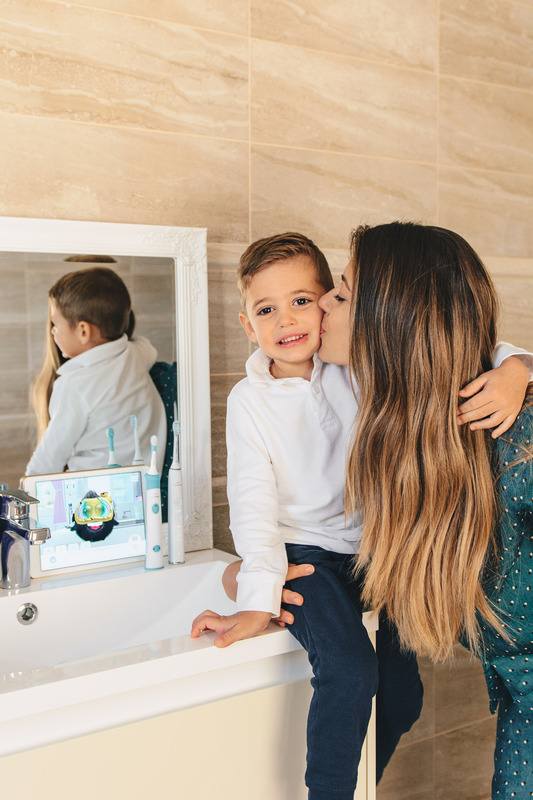 Final words: I’m happy that I started using Philips Sonicare DiamondClean Smart, and that my child is using his own Sonicare brush now. These are great gadgets and I really don’t regret tossing the regular brush. Is anyone using Philips’ sonic toothbrushes? Are you happy you made the switch?